Due to the abundance of foes with bow and arrow and lack of Plate Armor that needed cracking, wielding weapons without a shield never caught on as it did in Europe in later decades. Yet it would be against the Fatimids that the Mounted Nobles of Europe would experience an ominous prophecy of what would happen in their own lands, with Muslim Infantry wielding long-hafted maces and other polearms with considerable success against Crusader horses. 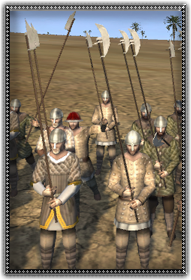 Semi-Professional levies armed with various sorts of polearms, terribly vulnerable to ranged weapons but cheap and effective against horsemen.